Tamariu is a small fishing village set in a dell with hills to all sides. 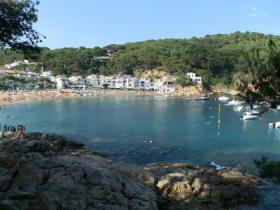 Officially it's part of the municipality of Palafrugell with the main town of Palafrugell approximately 3-4km away. There are two beaches - the main beach, and a second much smaller pebble beach to the left as you look at the sea. The bay is hemmed in by two rocky headlands. To the left it is quite steep, but to the right you can follow a footpath around the headland to Cala Pedrosa - a wild beach. In the hills behind and around the village are numerous villas and houses. It's a popular resort with French and Dutch holidaymakers. The village centre is quite small so there isn't so much to see, but it is quite picturesque. In summer Tamariu opens up and there are a selection of bars and restaurants on the sea front around the bay It has a seasonal supermarket and clothes/gift shops.At the back of the village is Camping Tamariu in a quiet valley location. The bay is marked off for swimming with boats mooring outside this line and a boat-taxi service out to the boats. The bay is compact - it's easy to swim from one side to the other. During summer there is a lifeguard service and there are practical things like toilets and fresh water showers. It is possible to hire canoes and there is a scuba diving place at the beach. The main beach is a mix of coarse grit-type sand with small pebbles in places, in other places the sand is a little finer. Sunbathers have three quarters of the beach, the last part is reserved for fishing boats. The main beach has a small rocky outcrop to one side. The area to the right of the outcrop is generally quieter and more private. In the evening this quieter part loses the sun first. The quieter pebble bay to the left is all pebble and hard on barefeet. Best with shoes or flipflops on. The people using this bay tend to be snorkellers and swimmers as it fabulous for seeing fish. From the main beach, there is a layer of pebbles as you enter the water. The beach then shelves away steeply so you are quickly out of your depth. The main bay area has a sandy bottom all the way out to the buoys which means there aren't so many fish so swimming is mainly just swimming. Around to the right, out towards the headland there is a diving board off the rocks about 2m above the water level. This has always been a splash with children. This rockier area is also better for wildlife. The pebble bay to the left has a rocky bay. It shelves gently, though this is tough on the feet as it's rocks all the way in. A better bet is to jump in from the side. The water here is normally crystal clear and there are usually shoals of fish in the bay. You can also swim around to an otherwise inaccessible bay. Canoes can be rented from the beach and there is excellent canoeing particularly as you get around to Aigua Xelida and then on to Aiguablava and Fornells. The bays immediately after Aigua Xelida beach have rocks and cliffs with narrow canyon type inlets and crystal clear water sheltered from the wind and waves of the sea and almost inaccessible other than on the water. Parking can be difficult during the height of summer. There are two smallish car parks along the main street through the valley. 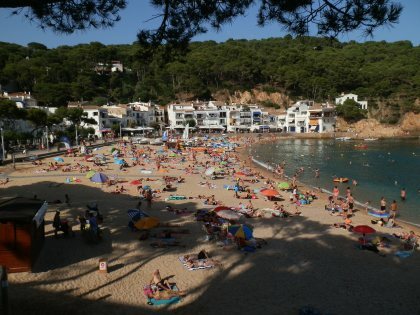 Alternatively road parking can normally be found on the road out towards Aiguablava/Begur - though it can mean a few minutes walk to get to the beach. The GR92 runs through Tamariu. 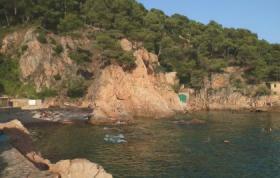 You can follow the path around the headland to the right through one wild beach and up to the lighthouse above Llafranc (San Sebastien).